The unique design of the Rack Mount Hinge yields an ultra-low profile enclosure of one vertical rack unit (1U or 1.75") when stowed (2U or 3.50" for the 20" model). 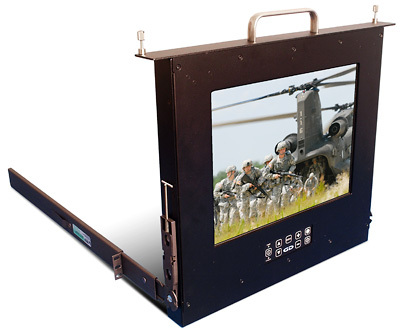 When deployed, the monitor pivots up or down 90° (factory configured) for operation and extends only about 4 to 6 inches from the rack chassis. 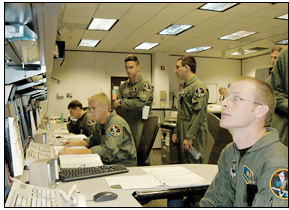 This increases operator workspace, which is especially important in space-constrained environments. 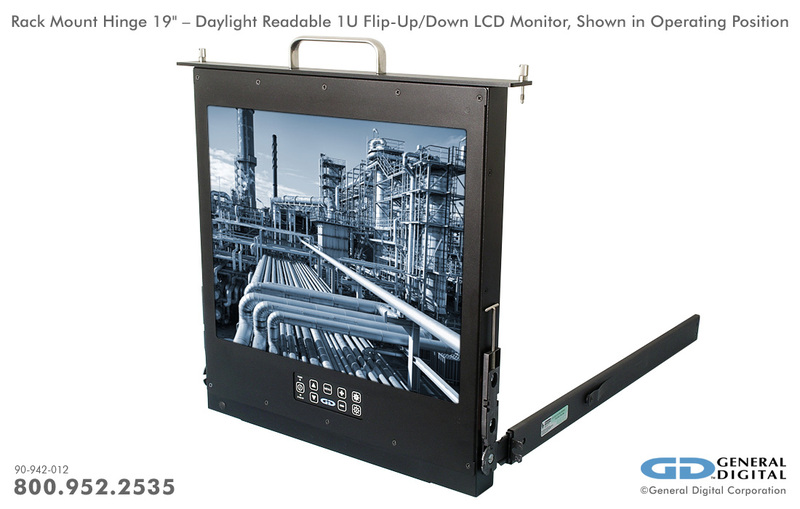 Additionally, the display can easily be located at eye level within your 19" RETMA rack to optimize ergonomics. We work with you to configure and build your Rack Mount Hinge monitor to meet your precise needs. Furthermore, we offer a wide range of practical options for you to custom design your unit. General Digital’s rugged aluminum enclosures are designed to withstand the rigors of commercial, industrial and military environments alike. Our enclosures have an irridite coating (conductive anodized), which provides protection from corrosion and improves the shielding properties where metal parts make contact with one another. All external surfaces are finished with a durable black powder coat. They offer superior configuration flexibility, thus eliminating extensive redesign while still permitting us to incorporate contemporary technological advances. Custom designed slides allow the Rack Mount Hinge to conveniently slide in and out of a 19" RETMA rack while occupying only 1U of rack space (2U for the 20" model). The slides also allow the display head to pivot up or down 90 degrees (factory configured) for optimal operation. The Rack Mount Hinge requires no assembly or disassembly to operate—simply pull out and pivot 90° to use. All of the interfaces (video, serial, power, etc.) utilize shielded locking connectors that are (typically) located on the rear of the enclosure. To provide even greater protection, a sealed gasket is installed between the display and bezel, as well as between the bezel and protective overlay, to guard the monitor’s electronics from dust, liquids (e.g., spilled drink) and other debris. The slim enclosure is typically available with an integrated (or externally attached) power supply that operates from +12 Vdc or +24 Vdc. Optionally, an AC switching power supply is available. For applications requiring a thinner enclosure or a unique power source, we also offer a separate external supply as an option. General Digital can integrate virtually any LCD display size/resolution, from almost any panel manufacturer (OEM), into our Saber enclosures. To assist in selecting the right panel for your application requirements, we have provided a list of commonly used or recommended panels for standard/low luminance, high brightness, sunlight readable and NVIS compatible needs. New display models are constantly being introduced to the market by the LCD manufacturers, making it extremely difficult for us to maintain a comprehensive list. For this reason, we encourage you to speak with a Sales Engineer to share your price and performance objectives, so we can assist you in making the best display selection. If our stock offering does not suit your needs in terms of size, fit or function, please contact a Sales Engineer and we will work with you to configure a system to your specifications. Customers can also request that we integrate one of our many LED-based sunlight readable, NVIS or sunlight readable/NVIS enhanced displays into their Saber product. These solutions provide many advantages, such as increased longevity, improved durability, higher brightness, lower power consumption and/or NVIS compatibility. The Rack Mount Hinge can be configured with a variety of standard or custom user controls, including membrane or silicone keypads, both with or without LED backlighting. Most models can be configured to provide NVIS compatibility or configured with electronics that allow backlight dimming. Photo shows optional speakers on the 20" unit. Below is an overview of typical General Digital Rack Mount Hinge Series model numbers. Having a good understanding of the structure of our model numbers will help you configure your monitor. 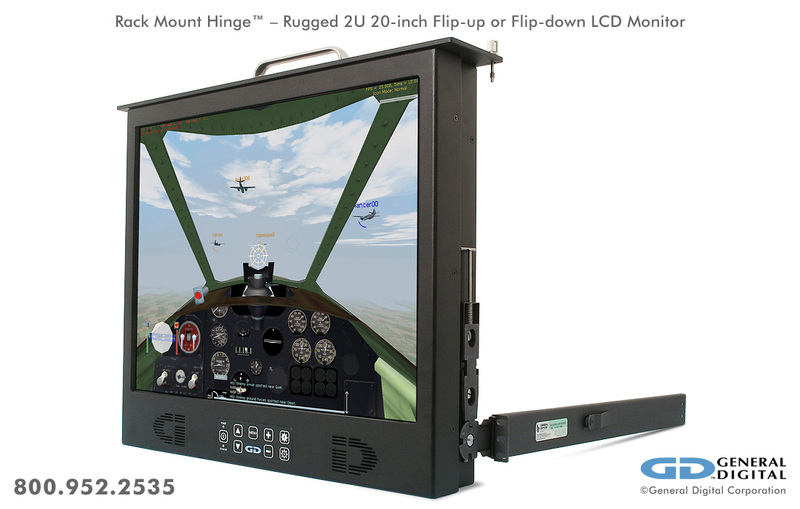 The Rack Mount Hinge enclosures have been carefully designed to allow our design engineers to modify/customize the existing designs to accommodate a large variety of display size/resolution combinations. Customers greatly benefit since they can request virtually any OEM LCD of their choice for integration, or select from an evolving list of value-added Genflective, Sunlight/High Brightness or NVIS-Compatible enhanced LCDs. Below are listed the most popular video controllers for use with the TwoView Series. Please inquire with a Sales Engineer for more information. The enclosure used is determined by General Digital, based on the best fit for the intended application, after discussion with the customer. 15.0" 1.75" (1U) x 19.00" x 16.63" / 20.00"
17.0" 1.75" (1U) x 19.00" x 18.12" / 20.00"
1.75" (1U) x 19.00" x 15.81" / 20.00"
17.3" 1.75" (1U) x 19.00" x 18.12" / 20.00"
19.0" 1.75" (1U) x 19.00" x 18.12" / 24.00"
20.1" 1.75" (1U) x 19.00" x 15.81" / 20.00"
The Rack Mount Hinge is highly configurable. There are many overlays that can be added in front or behind the LCD to improve its performance. Please speak with a Sales Engineer to select the right overlay for your budget and performance requirements. Note that a unique numerical identifier will be assigned depending on the specific overlay(s) selected. Download our full list of assigned overlays available. 1 Since the RH and SRH Series do not include an embedded power supply, we strongly recommend the purchase of a General Digital-manufactured power supply, which is specially designed and tested to work with our LCD monitors. 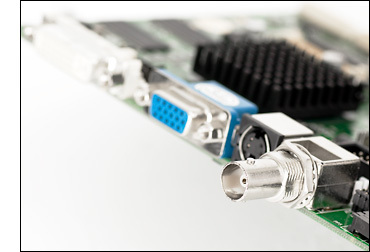 Please note that this supply includes the required DC harness and connector to interface to the Rack Mount Hinge. 2 Consult a Sales Engineer to select from a multitude of standalone AC switching or DC–DC supplies that can be mounted within the customer’s rack. General Digital can assist in specifying a commercial, industrial or military power supply that will meet your specific requirements. 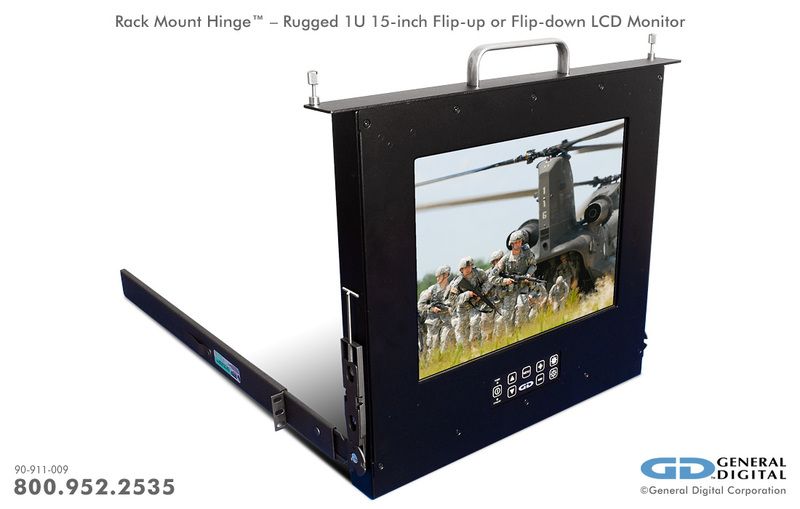 The photos below represent a small sampling of General Digital’s standard and custom Rack Mount Hinge LCD products. They serve to illustrate the many display sizes and mechanical configurations we offer, as well as standard and custom design features, capabilities and options. Click the thumbnails to view full-size photos. 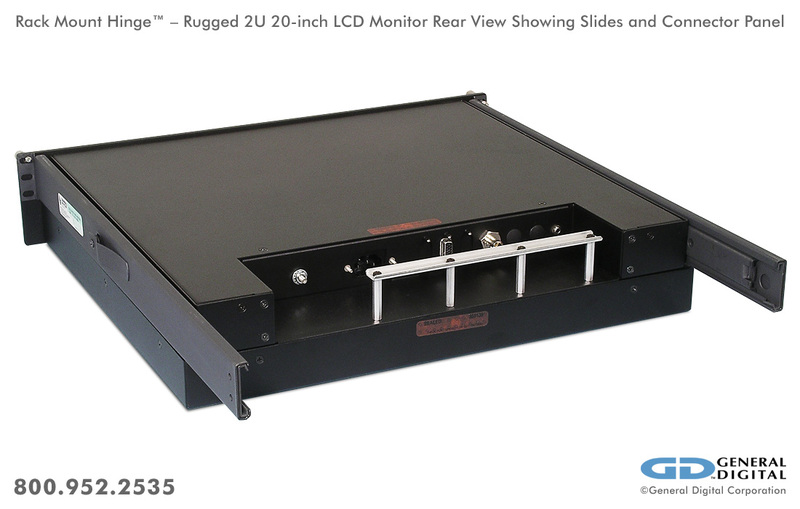 Rack Mount Hinge Solar 19"
Watch the videos below to learn more about our Rack Mount Hinge and other flip-up monitors, as well as display services General Digital offers for most monitors, whether built by us or another manufacturer.